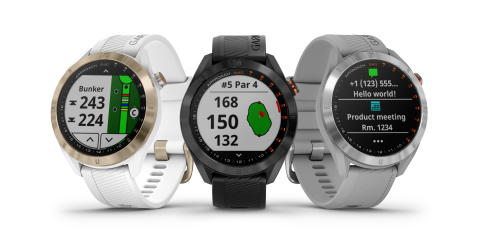 OLATHE, Kan.--(BUSINESS WIRE)--Garmin International, Inc., a unit of Garmin Ltd. (NASDAQ: GRMN), today announced the versatile Approach S40, a GPS smartwatch specifically designed for golfers to use on the course or as a sophisticated timepiece. The lightweight watch features a vibrant 1.2-inch color touchscreen display that is sunlight-readable for everyday use and a metal bezel to bolster its elegant design. Additionally, the smartwatch is fitted with adjustable, quick release bands—available in different colors—to easily tailor the watch to a golfer’s personal style. The Approach S40 integrates AutoShot Game Tracking to measure and auto-record a golfer’s detected shot distance1 for a more focused gaming experience, and thanks to its highly responsive GPS receiver, this stylish smartwatch conveniently locks in on a golfer’s location and displays precise yardages to the front, middle and back of the green, hazards, doglegs and more. Golfers will also have access to over 41,000 preloaded courses from around the world. In addition to the style and smartwatch capabilities of the Approach S40, golfers will have the opportunity to explore an in-depth golf feature set directly from their wrist. Veterans or novice players can strategically use the Green View feature to help enhance their golf accuracy by manually dragging-and-dropping the day’s pin location on the display to gain precise yardage. Golfers will also be able to use the watch to see digital scorecards with Stableford scoring and automatically upload these scorecards to the free Garmin Golf™ app.2 Once the app is downloaded, golfers can take advantage of automatic course updates, and even review stats in real time during play or after a round with a compatible smartphone. The Approach S40 features a rechargeable battery that is capable of lasting 15 hours3 on the course, and up to 10 days in smartwatch mode. A bundled version of the watch adds a three-pack of Approach CT10 club sensors that can be paired for additional automatic game tracking capabilities. The versatility of the Approach S40 to serve as a stylish smartwatch allows golfers to personally accessorize the golf watch in a variety of combinations. By easily removing the watch band with a quick slide of the bar, golfers can fit new bands in place to keep their style fresh at all times. Golfers can then sync the watch with a compatible smartphone to receive smart notifications2 for incoming calls, texts, e-mails and additional alerts that can be displayed on the wrist. The Approach S40 also provides resourceful activity tracking features4 such as steps, sleep and built-in multisport profiles for fitness initiatives. For decades, Garmin has pioneered new GPS navigation and wireless devices and applications that are designed for people who live an active lifestyle. Garmin serves five primary markets, including automotive, aviation, fitness, marine, and outdoor recreation. For more information, visit Garmin's virtual pressroom at garmin.com/newsroom, contact the Media Relations department at 913-397-8200, or follow us at facebook.com/garmin, instagram.com/garmin, twitter.com/garmin, or youtube.com/garmin. 3Battery life may vary depending on usage.